For the details of some values, refer to the other article from this blog like feedding a physically based shading model or GDCEurope 2013 talk : The art and rendering of Remember Me. The color is provide in sRGB 0-255. The diffuse part of the base color (the one use by the non-metallic) must be in the range of the first gradient 50-243. There is some sample values of real world material in sRGB below the gradient. Some of these values are base on real world measured material (from misc sources, not done by us) and other are have been generated by Laurent Harduin. He take calibrated raw picture of representative material, take the luminance histogram in Photoshop and use the value of the medium axis for the luminance. Then he blur the picture and take one pixel inside the blurred region and use that as the color value. This explain why in few case like the clean cement the color and the luminance doesn’t match perfectly. We also lower a bit the value to take into account the invevitable specular present during the capture. The reflectance part (the one use by metallic) must be in the range 186-255 (not present in the chart). Some example are provided below the grey square. Most of the time the metallic color of material match what the eye see. Simple monochrome linear parameter. Range is 0-1 but the gradient is from 0-255. The yellow sphere below represent in-engine capture of a sphere and a cube. The specular part of Disney “principled” BRDF is a GGX BRDF. It use a roughness parameter. This roughness is the “Disney roughness”, not the real GGX roughness. Disney Roughness = sqrt(Roughness). When use at runtime this Disney Roughness is transform to the GGX roughness with roughness = Disney Roughness * Disney Roughness. The gradient display roughness from 0 for smooth (left) material to 1 for rough material (right). The grey gradient are from 0 to 255 and red segments are displayed every 1/10 with a sphere like object below to show the in-game result of the designated value. The first row of real world image above represent no metallic object, the second row represent metallic object. Goal is to give artist a better feeling of what is roughness. The first row of sphere like object represent metallic object, the second row represent non-metallic object. Note: The roughness here is coupled with the BRDF used by the Unreal engine 4, it may not be compatible with other engine or offline renderer. The Dontnod chart include an unusual parameter named Porosity. This parameter is the “open porosity” of a material. It can be used for driving weathering and aging effect (Pollution, rain, aging…). More details on its usage can be found in previous blog post: Water drop 3a – Physically based wet surfaces and Water drop 3b – Physically based wet surfaces. In practice Dontnod use it mainly with the dynamic wet formula provided in the mentionned previous post. The range is remapped from 0-1 to 0-70% of open porosity. There is real worl image to try to give a feeling of what the value mean. An extremely porous material is the clay (70%), but open porosity can vary a lot for same material, clay could also be only 50%. From Kevin Hnat thesis . French translation from top to bottom. 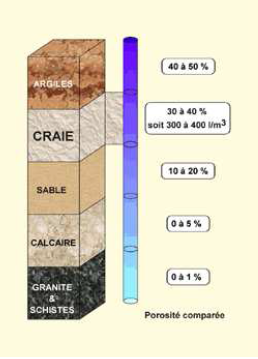 Clay, chalk, sand, limestone, granite. Note: The porosity parameter is not used in the BRDF formulation. More research need to be done on this topic and currently there is only one porosity BRDF paper available which doesn’t fit with the current need. There is no chart for the reflectance value of the Unreal engine 4, just let the value by default and apply a cavity map on it. The previous chart was based on modfied Unreal engine 3 where I introduced a new physically based renderer based on Blinn-Phong BRDF. This new chart is based on the Disney “principled” BRDF use in the Unreal engine 4 which is based on the GGX BRDF. The glossiness of the previous chart and the roughness of this one do not match. Moreover, the range is inversed. 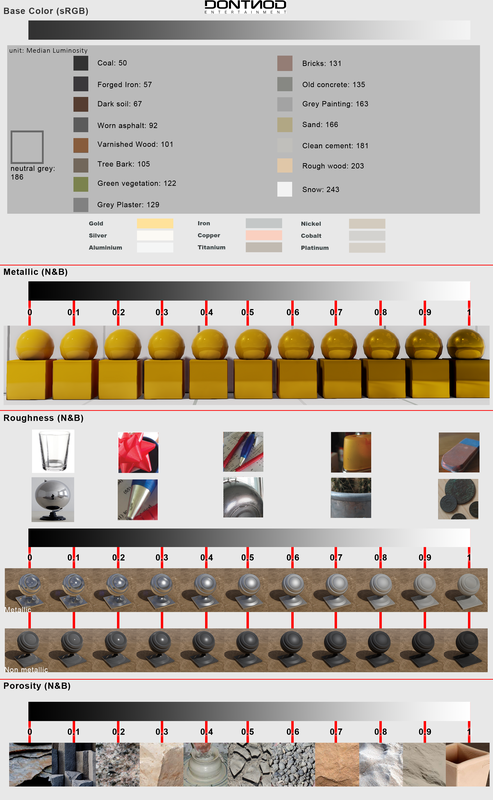 Previous specular value for metalic can be reuse for Unreal engine 4 reflectance parameter. UE4 use a mapped range of 0-1 to 0.08, so you need to do the conversion. But in practice there is so little difference that’s it is not necessary to use the precise values. Just an FYI, if you had saved the chart as a PNG file it would be smaller than the ZIP’d TGA and wouldn’t require the file extension hack. Since when is PNG lossy compression? Haha, you are totally right and I am just stupid. Don’t know why I was guessing that, messing with jpeg I think. Thanks for the feedback I updated the post. Hello and thank you for the chart. If I am not using a texture, but a constant to drive my base color I assume I would need to use the linear values like 0.04 for charcoal and such? For baseColor the chart is only about texture. If you use constant, UE4 expect a linear RGB value [0-1]. You are right. Hi ya – looking at the Siggraph paper for UE4 stuff, I had thought that “Disney’s roughness” was roughness^2, _not_ sqrt(roughness). Am I misunderstanding something? Be careful about what we are talking about. What is present in the chart is the Disney roughness (the one which is perceptually linear). When use in the engine you need to transform it to GGX roughness. This is roughness = DisneyRoughness * DisneyRoughness. What does N&B refer to? Haha, that is indeed a good question . N&b (noir et blanc in French ) mean b&w (black and white), i.e the texture is monochrome. I update the base color description to explain a bit where the value of color albedo come from (Thanks to Steve Hill to ask the origin).